357 Sig is a round that maintains its popularity partly out of brand devotion (SIG Sauer), partly out of its use in law enforcement (ready supply of components and familiarity), and mostly because of the benefits and characteristics of the caliber itself. It can be a bear to manage properly, but reloading 357 sig brass is a solid return on time spent, and a great cartridge with which to build your reloading repertoire. 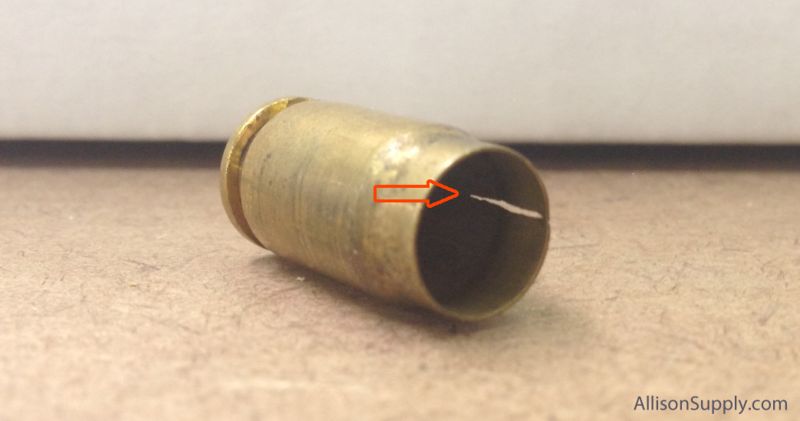 When we see 357 Sig brass that has failed, it is typically a cracked case from near the rim down to below the tapered shoulder of the case (the “bottleneck” of the 357 sig is somewhat notorious for wearing out there first). 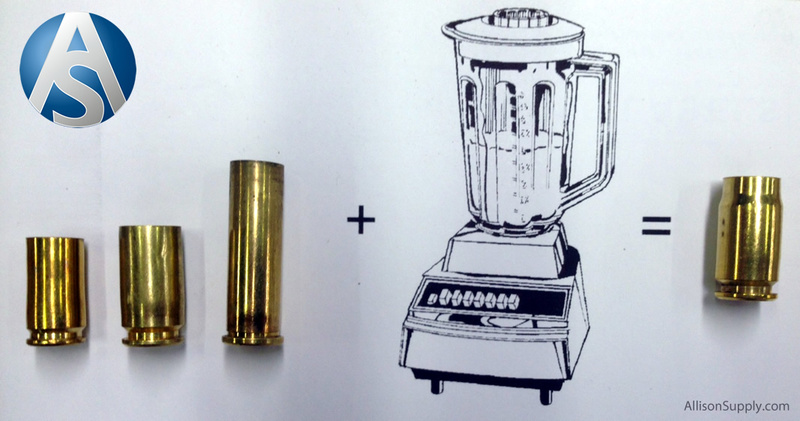 While a 357 case won’t last for as many reloads as a 40SW in a fully supported chamber will, it should still serve you well if you start with once fired brass and don’t load incredibly hot rounds. 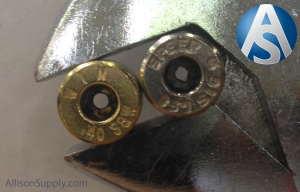 Some 357 sig manufacturers have chosen to tweak their load performance by having smaller than normal flash holes, so when depriming/decamping you should be aware that this is possible and use smaller depriming pins than normal if necessary. The photo shows a standard .40S&W flash hole as compared to the one in the .357 sig flash hole by Speer. 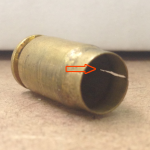 We’re sure that if you reload in high volume that you’ve broken at least one decapping pin on a 357 sig that sneaked through while loading 40! From a value standpoint, 357sig can be a difficult round to find on store shelves, and when you do it is more expensive than the ubiquitous 40SW or its other cousins. 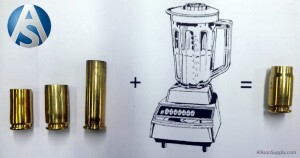 The components for 357 sig, however, are easier to come by. We have both yellow brass .357 sig cases and nickel plated .357 brass in our online store; .357 Sig Brass available here, and .357 Sig Nickel Plated Brass available here. 357 sig takes standard small pistol primers, and utilizes (depending on your press manufacturer) many of the same components you’d use for reloading .40 or 9mm. Nickel plated typically ranges from .165 to .167 ounces per piece, or between 10.31 and 10.43 pounds per 1,000 357 nickel casings. Yellow brass typically ranges from .164 to .167 ounces per piece, or between 10.25 and 10.43 pounds per 1,000 357 sig casings. Some variation can occur between manufacturers, and the data above is based on once-fired factory loads. With the primers out, .357 sig brass cases approximate .158 ounces each. If you have any advice or other experience with reloading 357 sig brass, as usual we’d love to hear about it! We want to be your source for brass cases for reloading. While here you can shop online for brass cases at our store, or take your time and read our how-to and other reloading articles. Thanks for visiting, please send us a message with any requests or feedback, and we hope that you safely enjoy reloading! We hope you find what you need, but if we can assist in any way please do not hesitate to let us know.